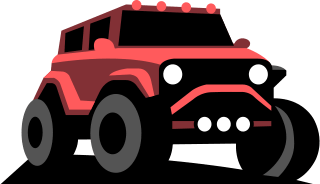 As the SUV market moves further in the direction of the unibody, car-based platforms each year, larger and more expensive truck-based alternatives become more and more obsolete. There are several midsize SUVs on the market that are significantly cheaper and possess three rows and nearly the same cargo capacity as the Yukon XL. However, these SUVs aren’t as capable off-road as 4X4 truck-based models and can’t tow as much. If you don’t do either of these activities, you may want to consider the redesigned 2018 Equinox or GMC Acadia. They are equally roomy, more efficient, and easier to drive. 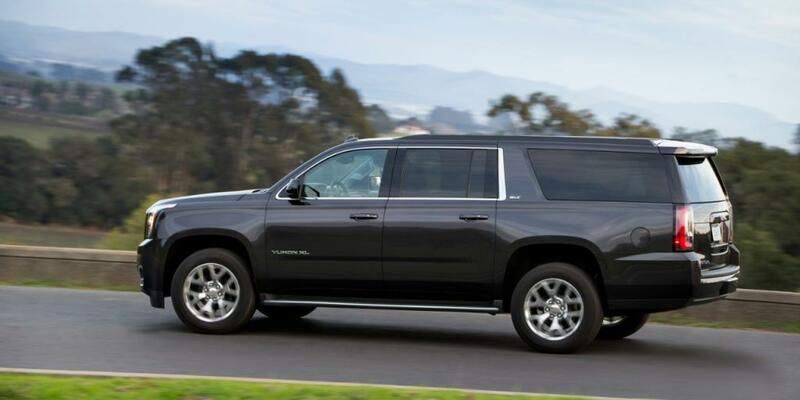 If you need a truck, the Suburban is a better buy unless you want the Denali’s detuned Corvette engine and superior air suspension which isn’t cheap but will save you quite a bit of coin compared to the Escalade ESV. The Yukon XL is, essentially, a Suburban with some different interior and exterior trim pieces and an inflated price tag. So, what are the benefits of shelling out a couple extra grand over the Suburban? In short, improved seats, a standard Bose sound system, different wheels, and acoustic glass that enhances noise cancellation. The somewhat sleeker exterior may be worth it but we realize that’s subjective. The few upgrades may be difficult to rationalize unless you planned to spend extra on premium audio. A Suburban will save you a few thousand dollars without sacrificing much in the way of refinement. The Yukon XL is not your average unibody crossover. It’s a bonafide body-on-frame large SUV. Based on the Silverado 1500 pickup truck, the Yukon XL is true to its truck roots. As a result, This SUV has the ability to tackle trails, tow, and take abuse better than car-based crossovers. The opportunity cost is an increased ride height and elevated center of gravity that generate significant body roll when cornering, noticeably more than car-based counterparts. Yet the same characteristics contribute to sublime ride quality on the highway and even imperfect roads. This SUV is available with two different powertrains. 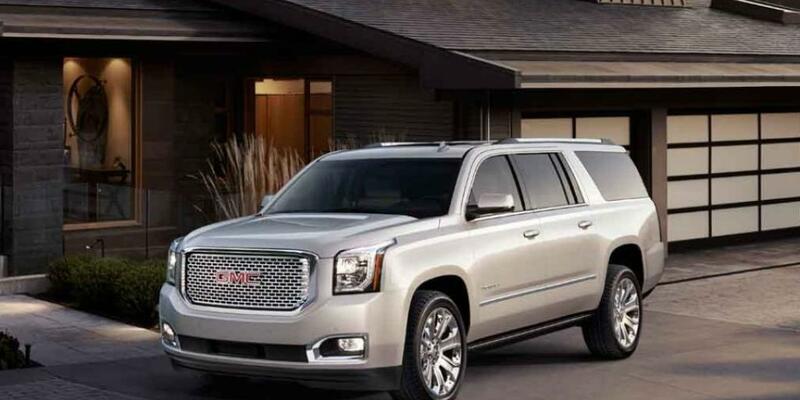 A 355 horsepower 5.3 Liter V8 and a 420 horsepower 6.2 Liter V8, available only on the Denali model. The 5.3 Liter accelerates from zero to 60 mph in 7.5 seconds, while the more powerful Denali does the same in just 5.8 seconds. That’s quite quick for such a large SUV! As a result, neither engine excels in efficiency. The 5.3 Liter receives an EPA rating of 16 miles per gallon city and 23 highway, 1 less mpg for the Denali and 4WD models. Both engines are coupled to a 10-speed automatic for 2018 that, surprisingly, doesn’t change the EPA ratings. 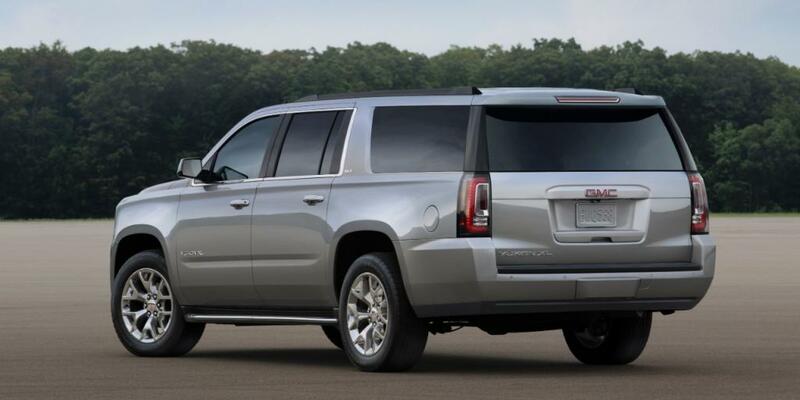 The Yukon XL can tow 8,500 lbs, one of the highest ratings in the class. The Yukon XL has some of the best brakes in the business and is universally respected for exceptional stopping performance in both dry and wet weather. The Yukon XL may never inspire confidence in the twisties but that’s not what it’s designed to do. It will provide a plush ride and ample towing ability that make it one of the best SUVs for road trips and carpools alike. 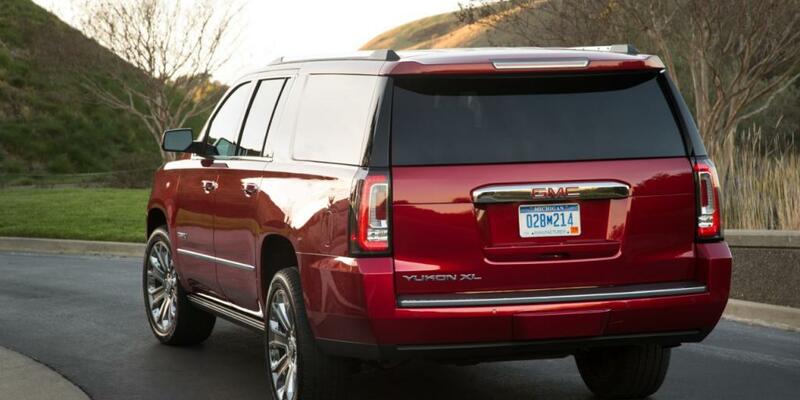 The Yukon XL distinguishes itself from the Suburban inside by adding more standard features. SLT and higher trims obtain two-tone, contrast stitched soft-touch panels. A stellar Bose premium audio system is standard fare. Extra firm foam fills the seats for added comfort on long road trips. 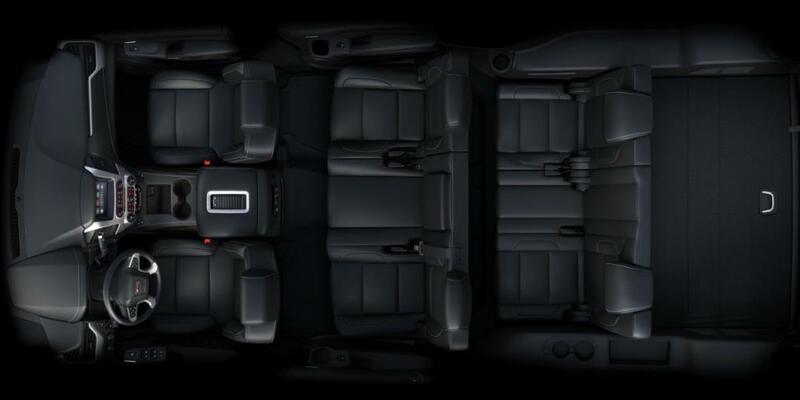 The Yukon XL is one of a handful of SUVs that can be equipped with a front row bench, allowing up to nine passengers total. Second-row captain’s chairs can be installed but you lose seating for one passenger. The third row can actually accommodate adults. The controls in the Yukon XL are lauded for their simplicity and location. Oversized knobs for the climate control system and audio system permit frustration free adjustment. The IntelliLink infotainment system is an intuitive touchscreen system and has integrated OnStar 4G LTE that can connect several mobile devices. This system supports both Apple Car and Android Auto. You can use the internet stream music and operate many popular applications. A rearview camera system is also standard, making the gargantuan a little bit easier to park. The system has been castigated for intermittent functionality, an issue further addressed in our reliability section of the review. 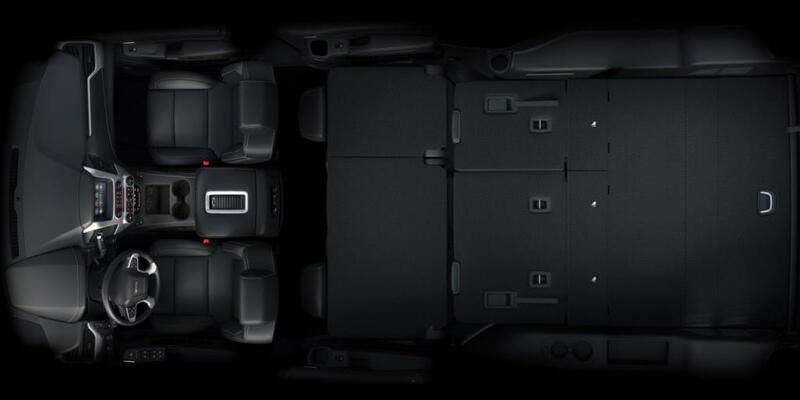 The Yukon XL has fold-flat rear rows, allowing increased cargo capacity. An overall 121.7 cubic feet is the maximum and an impressive 39.3 cubic feet trails the third row. Some owners say the lofty load height prevents easy loading and unloading for humans of average height. However, the Yukon XL is basically a big truck, so that should be expected. It still affords a premium interior that’s a step up from the Suburban. 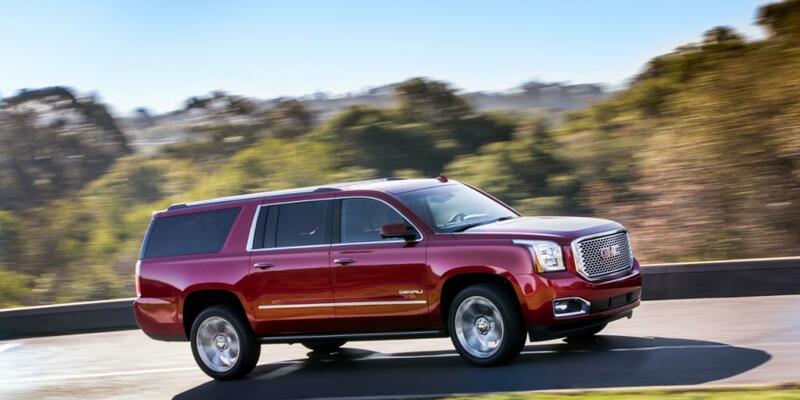 The Denali trim further elevates cabin quality without being too flashy, like Escalade ESV. Although it’s basically a rebadged Suburban, the Yukon XL wears exclusive sheet metal with distinguishing details. The headlamps are stylish with standard integrated LED daytime running lamps. A large chrome grille receives restyling for 2018 and still wears the GMC badge. Denali models gather a different chrome grille for 2018, in place of the mesh chrome grille in years past. Looking at the sides, it would be tough to tell a Yukon XL from a Suburban without noticing the badge. Lower trimmed Suburbans don’t have the side body moldings that’s on all Yukon XL models and top-trimmed Suburbans. The fender flares on the Yukon XL protrude outward a little more, a difference that’s nearly imperceptible unless a Yukon XL is right next to a Suburban. The rear ends are even less convoluted. The GMC rocks a different tail light design and on models any color but black, there’s a tell. If the D pillars are blacked out on a non-black SUV, then it’s a Yukon XL. All Suburbans receive body-color D pillars. The Yukon XL’s are black, making the roof appear as if it is floating, from the rear. In addition, Yukon XLs wear different wheels wrapped in premium rubber to differentiate themselves further from their Chevy roots. The Yukon XL is a premium SUV that offers a luxurious SUV without the outward ostentation of its upmarket sibling, the Escalade ESV. It’s a practical alternative for the more subtle consumer. 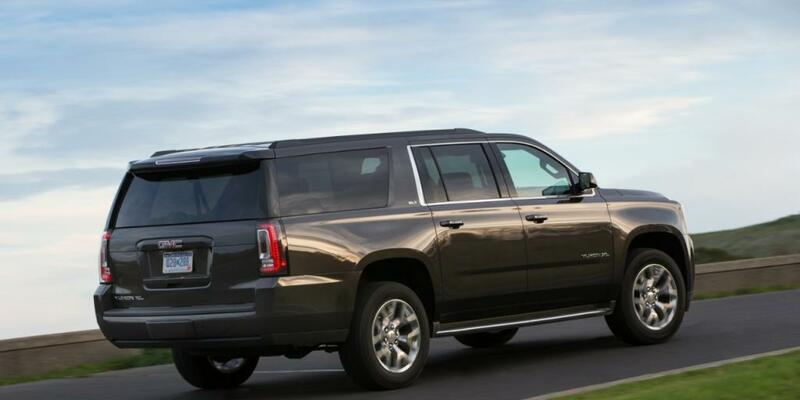 The Yukon XL is awarded a 4-star overall rating from the National Highway Traffic Safety Administration. It received 5-star results in the side crash tests but performed poorly in the rollover and front crash test. The Insurance Institute for Highway Safety hasn’t perfromed crash testing on the Yukon XL but awards the available pre collision technology as “BASIC,” the lowest rating possible. The Yukon and Yukon XL are based heavily on the Chevrolet Silverado 1500, which has been crash tested by the Insurance Institute for Highway Safety. In IIHS testing, the Silverado collects all “GOOD” crashworthiness ratings except for the small overlap front test that obtains an “ACCEPTABLE” rating. Intrusions in the lower leg area of the safety cage indicated an injury to left leg is probable in a similar accident. That’s still not a bad performance overall and it’s possible the Yukon XL would perform even better due to its larger size and higher weight. It’s a large SUV that weighs close to three tons. Basic physics decrees you’ll most likely be on the better side of an unfortunate collision because of increased momentum. In the off chance you’re not, the OnStar emergency telematics feature will automatically send emergency services to your location in just a few minutes. The full side curtain airbags and seat mounted side airbags should do an admirable job of mitigating serious injuries. The standard teen driver feature supports speed and volume limits, should you bestow your keys upon your privileged offspring. As with any large SUV, safety should be one of its strongest traits. The 2017 GMC Yukon XL is awarded a 2.5 reliability rating from JD power, this generation has been rated as high as 3.5 in 2015, the first year of the current iteration. Consumer Reports is less optimistic and offers low predicted reliability ratings for the last several models. Many owners report the OnStar and GPS systems function intermittently. Though the OnStar WiFi hotspot is a robust feature that will attract many to this SUV yet it may not function reliably after just a few months. There are also grumbles of difficulty pairing and using voice commands. Another common complaint is mediocre body integrity. The weather stripping doesn’t go the distance and may allow wind and road noise to make its way into the cabin. A flawed transfer case will not switch out of 4X4 mode. The NHTSA record reveals even more issues. The 2015 model had 7 recalls, one of the higher numbers around. All but 2018 Yukons are troubled by a failure of airbags to deploy. It’s a gigantic recall that involves some three and a half million vehicles. Any GM dealer should resolve the issue free of charge but the necessary parts may not be available. Another 500,000 GM vehicles were recently recalled for a transmission oil cooler line defect that could cause leak and subsequently, a fire. There are over 3,000 Technical Service Bulletins filed with the NHTSA between the 2015-2017 Yukon XL and 2015-2017 Yukon Denali XL. General Motors acknowledges hundreds of problems with these SUVs. However, the ubiquity of these SUVs ensures parts are plentiful and cheap. Labor costs aren’t either as any mechanic worth their weight has the ability to work on these vehicles. Despite a relatively low-reliability reputation, many Americans still choose this SUV, year in and year out. It’s a choice we won’t disparage but you should have a few thousand dollars saved for repairs and have a used model meticulously inspected before buying. Besides the Chevy Suburban, which essentially offers the same capability as the Yukon XL for less, the Expedition EL is a strong rival to the Yukon XL. It has a lower starting price, more space, and a higher towing capacity. However, its interior isn’t near as refined as the Yukon XL’s and it doesn’t yet boast integrated Wi-Fi. If your family absolutely has to stay connected, the Yukon XL may be the better choice. The Ford SYNC infotainment system is generally better than the GM IntelliLink system and also includes Apple CarPlay and Android Auto. 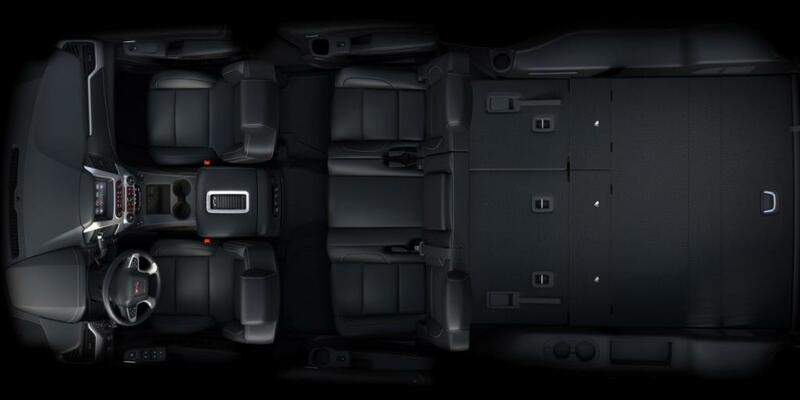 The Expedition EL’s third row provides even more room for adults. Though the twin turbo V6 delivers more torque at lower revs than the Chevy’s V8, the fuel efficiency is a few miles per gallon lower. 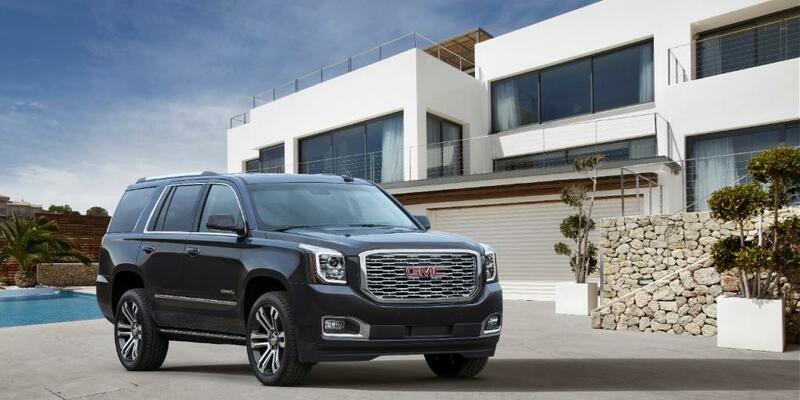 It’s still the better choice for towing, unless you opt for the Denali’s 6.2 Liter V8. The Ford also receives higher safety scores and has a better track record for reliability. We’d probably pick the Expedition EL for these reasons, though we’d admit it isn’t the svelte choice. We think the Yukon Denali XL is a capable contender to the Escalade ESV for less money. The price difference between the two vehicles at the various trim levels is about ten thousand. Though they use the same engine and transmission, the Escalade picks up a few miles per gallon more, according to the EPA. The Escalade wins a battle of interiors with its semi aniline leather, though the Denali’s leaves little to be desired. However, many owners are frustrated by the Cadillac’s confounding CUE system, so we’ll give Intellilink the W in this category despite its poor reputation. The Caddy is bold on the outside with large, vertical LED lamps and lots of chrome. It’s great if you want to be flashy but we prefer the Denali’s more subtle design. Both models boast GM’s Magnetic Ride Control suspension, so they ride nearly the same. Having the same engine, they accelerate at nearly the same speed as well. The Denali XL is a tad quicker, thanks to smaller wheels and lower weight. We’d test drive both before buying and realize the Denali will save you thousands. However, we must admit the 22-way massaging seats available in the Escalade ESV make a compelling argument for flamboyance. The SLE trim begins at $53,075 for RWD and $56,075 for 4WD, equipped with a locking rear differential, 3.08 rear axle ratio, 150-amp alternator, 5.3 Liter EcoTec3 V8, Autotrac 4x4 active case (4WD model), StabiliTrak stability control system with brake assist, Premium Smooth Ride suspension with front coil-over-shock, trailering equipment, black assist step with chrome accent, fog lamps, daytime running lamps, outside heated power-adjustable manual folding mirrors, Solar-Ray deep-tinted glass, hidden rear wiper, Rainsense front wiper, luggage rack side rails, 18 inch bright machined aluminum wheels, 17 inch full size spare wheel. Inside, there’s tri-zone automatic climate control, remote vehicle start, remote keyless entry, cargo net, manual tilt steering column, leather wrapped steering wheel, multi color display, Onstar with 4G LTE and built-in WiFi hotspot, 8 inch diagonal color touch-screen IntelliLink infotainment system, CD player, SiriusXM satellite radio, HD radio, Bose premium audio system, floor mats, front and rear parking assist, premium cloth trimmed seating, manual folding 60/40 split third row bench, and rear window defogger. Standard safety features introduced are air bags with automatic occupant sensing system, tire pressure monitor system, and rear vision camera. The SLE Value Package includes 20 inch polished aluminum wheels, inside rearview auto-dimming mirror, power-adjustable pedals, power rear liftgate, and universal home remote for $1,930. The $545 Enhanced Driver Alert Package includes Low-Speed Forward Automatic Braking, forward collision alert, Haptic Safety Alert Seat, IntelliBeam headlamps, and lane keep assist. The Convenience Package installs an inside rearview auto-dimming mirror, power-adjustable pedals, universal home remote, and a power programmable liftgate with height adjustment for $730. The Interior Protection Package costs $250 and includes all weather floor mats and rear cargo mat. The $580 Heavy Duty Trailering Package furnishes a 3.42 axle ratio, trailer brake controller, 2-speed transfer case in 4WD models, and the Premium Smooth Ride Suspension Package with air leveler. The SLT trim has a starting MSRP of $61,125 for 2WD or $64,620 for 4WD, with standard push button start, a hands free power rear liftgate, IntelliBeam headlamps, power folding and power adjustable outside heated mirrors, a keyless entry system, wireless charging for mobile devices, a power tilt and telescopic steering column, a universal home remote, a leather wrapped and heated steering wheel, Forward Collision Alert sensor indicator, leather trimmed seating, a power folding third row, a power folding heated 60/40 second row bench, rear cross traffic alert, lane keep assist, and side blind zone alert with lane change alert. The Open Road Package adds integrated navigation, a power sunroof, and a rear seat entertainment system with Blu-Ray playback for $2,880. The Interior Protection Package costs an additional $250 and includes all weather floor mats and rear cargo mat to protect your carpet. The $3,070 Premium Edition provides a uniquely designed chrome grille, a polished exhaust tip, bright chrome bodyside moldings, and uniquely designed 22 inch chrome wheels. The Heavy Duty Trailering Package equips a sturdier 3.42 axle ratio, trailer brake controller, 2-speed transfer case in 4WD models, and the Premium Smooth Ride Suspension Package with air leveler for $580. An Enhanced Security Package installs a theft-deterrent system, self powered horn, interior movement sensors, vehicle inclination sensors, and broken glass sensors for $410. The Denali trim starts at $70,055 for 2WD and $73,055 for 4WD. It arrives generously furnished with an upgraded rear axle, a sturdier 170-amp alternator, an Autotrac 2-speed active transfer case (4WD), a 6.2 Liter EcoTec3 V8 engine, an integrated trailer brake controller, upgraded suspension system, bright body side moldings, 20 inch polished aluminum wheels with all season tires, 8 inch IntelliLink infotainment system with integrated navigation, perforated heated and ventilated front row buckets, and heated second row captain’s chairs. New for 2018 are a 10-speed transmission and Mastique Ash wood grain trim. The Open Road Package installs a power sunroof and a rear seat entertainment system with Blu-Ray playback for $2,385. An Enhanced Security Package provides a theft-deterrent system, self powered horn, interior movement sensors, vehicle inclination sensors, and broken glass sensors for $410. The Interior Protection Package runs $250 and includes all weather floor mats and rear cargo mat.